The fitz-bew song of this drab little flycatcher is the most reliable way to identify it. 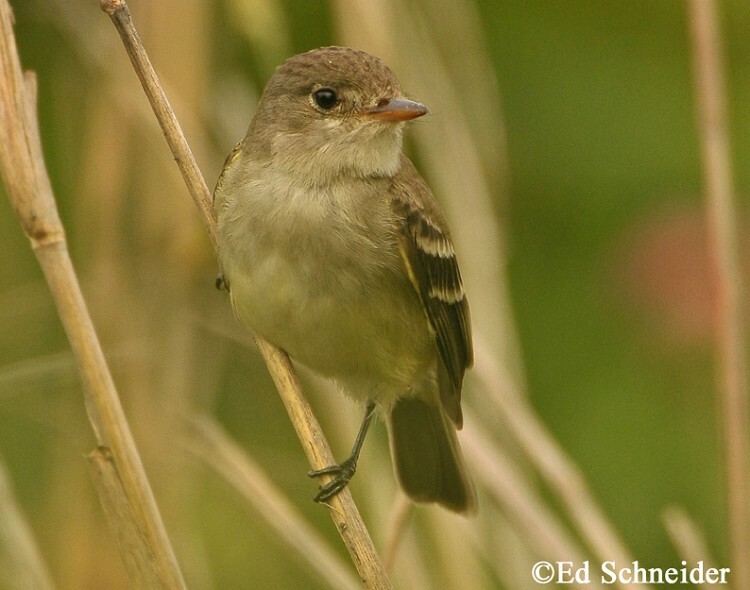 The Willow Flycatcher nests in scattered locations across Tennessee, overlapping with the closely related Alder Flycatchers only in the far northeastern part of the state. These two species are so similar in appearance that they were thought to be the same species, Trail's Flycatcher, until 1973. Rangewide the Willow Flycatcher nests further south than the Alder Flycatcher, and is found across southern Canada and through the middle of the United States. It spends the winter in Central and South America. Description: This small flycatcher is dull olive above, light gray below, has a white throat, and a whitish belly washed in yellow. It has two whitish wingbars, an indistinct eyering, and a short, wide bill that is dark above and pale yellow or pinkish below. Both male and female look the same. Voice: The song is characterized as fitz-bew. Alder Flycatchers are identical in plumage, and are identifiable only by voice. Other Empidonax flycatchers have more prominent eyerings, but are best distinguished by voice. Habitat: In Tennessee, Willow Flycatchers breed in moist, shrubby areas, often with standing or running water, and willow-dominated vegetation. Nesting and reproduction: Willow Flycatchers nest relatively late, starting nest building in late May and peak egg laying in mid-June. Occasionally males will have 2 females nesting in their territories. Fledging: Both adults feed the young, which fledge in about 2 weeks. The adults feed them for another 10 days or more. Nest: The female weaves the compact cup-shaped nest of weed stems, plant fibers, shredded bark, and grass, and lines it with feathers, hair, rootlets, and other fine materials. She usually places it in the upright crotch of a small tree or bush. Nest heights in Tennessee range from 3.5 to 15 feet above the ground, with an average of 6 feet. Status in Tennessee: Uncommon summer resident found in scattered locations from East to West Tennessee, usually below 3,100 feet. They arrive in early May and remain until September. Willow Flycatchers have only recently begun nesting in Tennessee. The first confirmed nesting was in Carter County in 1958. They spread to Meigs County in 1969, Blount and Knox Counties in 1970, Davidson County in 1971, Obion County in 1976, and Reelfoot Lake in 1982. The songs of the Willow and Alder Flycatcher are innate and not learned. In a research experiment, nestlings of each species were exposed only to the songs of the other species. The next spring, Willow Flycatchers were able to sing Willow Flycatcher songs, and Alder Flycatchers were able to sing Alder Flycatcher songs. Where the breeding ranges overlap, Willow Flycatchers will exclude Alder Flycatchers from their territories as well as other Willow Flycatchers. However, they will expend more effort to keep out other Willow Flycatchers. Best places to see in Tennessee: Locally common in Cross Creeks NWR, and below 3,500 feet in northeastern Tennessee, especially Johnson County. Yanahli WMA and the area around Columbia, TN is also known to have breeding Willow Flycatchers. North Cumberland WMA in east TN has birds on many early successional forested areas. Sedgwick, J. A. 2000. Willow Flycatcher (Empidonax traillii). The Birds of North America, No. 533 (A. Poole and F. Gill, eds.). The Academy of Natural Sciences, Philadelphia, PA, and The American Ornithologists' Union, Washington, D.C.